Finnlines and its subsidiaries transport passengers between Finland, Sweden, Germany, Poland and Russia. The company's passenger capacity was substantially upgraded through the introduction, in 2006 and 2007, of five huge new Ro/Ro-Passenger vessels able to carry up to 500 passengers each. These five mega-vessels have dramatically improved the level of service on the route linking Helsinki (Finland), Rostock and Lübeck/Travemünde (Germany). The service is daily and transit time on this vital link for the Finnish economy has been brought down to 27 hours. 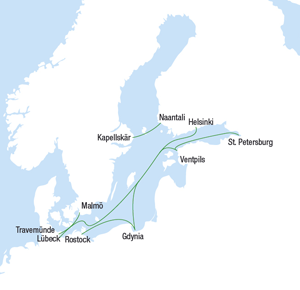 In addition, since June 2009 the route has also been operating with six weekly sailings via Gdynia in both directions. Other passenger services run by the Group include the Lübeck/Travemünde - Malmö route, serving the Southern Sweden market, and the one linking Naantali (Finland) and Kapellskär (Sweden). Meanwhile, the high potential Russian market is served from Lübeck/Travemünde, via the TransRussiaExpress maritime link to St. Petersburg (Russia).